Photographs, paintings, reports, and promotional mail. Some things aren't meant to be bent. With these 17 x 21 Envelopes, we guarantee that your precious items will stay that way. The high quality cardstock material makes this envelope unbend-able, which then makes your items unbend-able as well! These envelopes are also known as cardboard mailers, photo mailers, and stiff mailers. 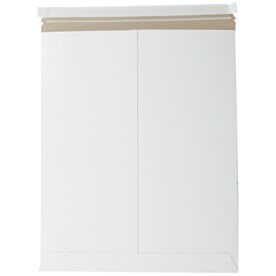 And the substantial size will certainly make your bigger items finally have the home they were searching for. No more shoving your items inside and no more worries! To make it easy for you to decide on which jumbo envelope is suitable for you, we've sorted our envelopes by color. 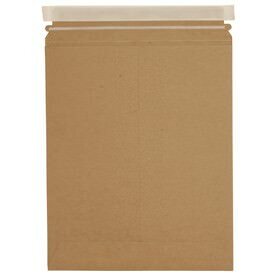 Try our white 17 x 21 envelopes for a super bright and clean look or go natural with our brown jumbo envelopes. Both are considered open end envelopes, which means that they open on the short side. This makes it better for your documents since they will stay inside longer. These peel and seal envelopes have the perfect closures for your valuable items! All you have to do is peel, seal, and send off. It's that simple. Both are 100 percent recycled, great for the environmentally friendly person in all of us. Make sure your photographs do not bend, and keep them as good as new with these jumbo envelopes.